A new report from the Federal Reserve Bank of New York showed that manufacturing activity in the Northeast region of the country slowed considerably this month. 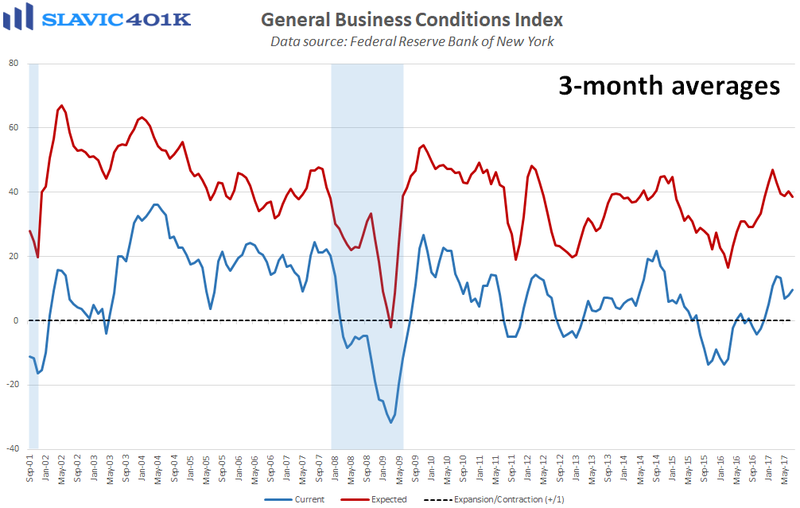 Specifically, the general business conditions index fell from +19.8 to +9.8 in July, the largest monthly decline since April and the lowest headline reading since May. Under the hood, current measures of new orders, shipments, total employment, and hours worked all deteriorated in July but surveyed managers’ reported plans to boost technology investment rose. Although a generally disappointing report, the pullback in July is not too surprising considering that in the prior month the index posted its largest gain in more than a decade. However, this is not the only regional activity gauge that has weakened recently, suggesting that business sentiment may continue to soften until real progress is finally made in Washington in the areas of tax cuts and regulatory reform.